One gents, Cartier Tank Francaise Chronoflex Chronograph Quartz wristwatch electronically tested stainless steel, Case: 37 x 28mm, Case Back: secured by four set screws, engraved with the manufacturers name, information, and ID numbers, 18KT yellow gold Cartier Signature Crown: octagonal, set with a blue cabochon crystal, Bezel: brushed finish, Crystal: synthetic sapphire, Movement: quartz. 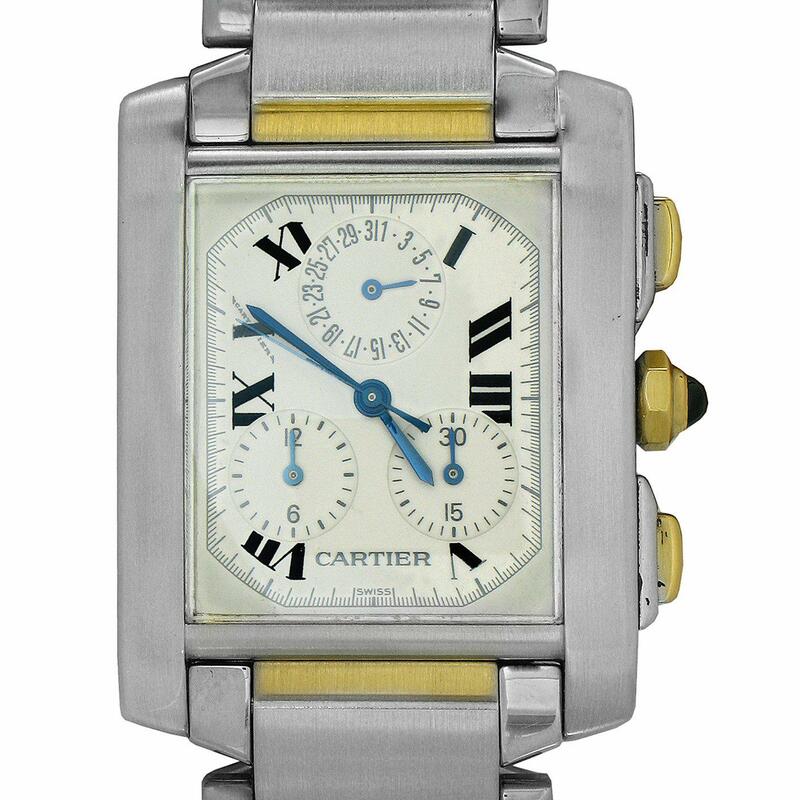 Cartier signed Dial: Ivory color, with Blue steel pointed hands and Cartier Roman numerals, Chronograph Functions: sub dials for; date, minutes, and hours, Chronograph Pushers: 18KT yellow gold, Cartier Bracelet: stainless steel brushed finish panels, separated by 18KT yellow gold bars, set within a bright polish frame, Condition: G-7 Near Mint. Seven and one quarter inch length, with a Cartier concealed deployment clasp. Three removable links.